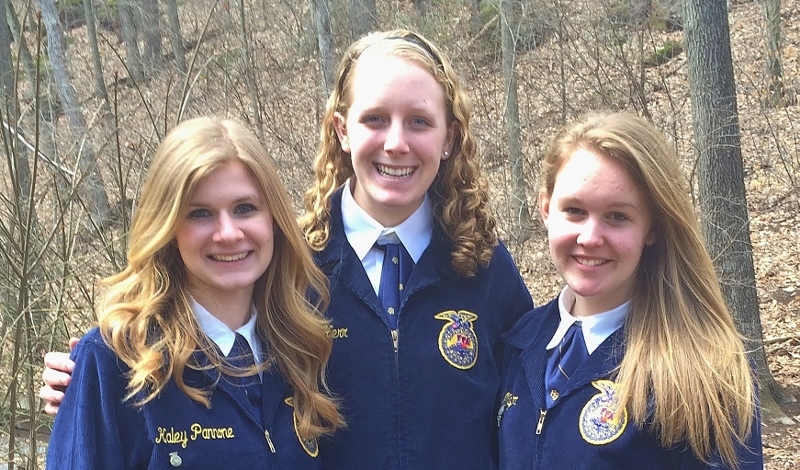 Penn Manor High School senior Kayla Major has earned the opportunity to compete on the state level after winning the extemporaneous speaking competition at the 2014 Regional Speaking Contest sponsored by the Pennsylvania FFA Association. More than 60 students from 14 schools participated in the contest, held April 8 in Newmanstown. In the extemporaneous competition, students choose three topics at random from a hat and are given 30 minutes to prepare a four- to five-minute speech on one of the topics. They then must answer questions about the topic. Another PMHS senior, Victoria Herr, placed fourth in extemporaneous speaking. Penn Manor freshman Kaley Pannone placed ninth in the creed speaking contest, which challenges students to recite the FFA Creed and answer questions about it. 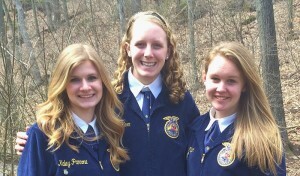 Congratulations to all three students, who are members of the Manor FFA. Pictured, from left, are Kaley Pannone, Victoria Herr and Kayla Major.